The public can be served better than to have spokespersons tell us, as they have since the SARS (severe acute respiratory syndrome) concern, it’s a myth that people are more prone to getting sick from flying due to germs circulating in the air. The research has not been done. The spokespersons then cite misleading information, such as aircraft ventilation is great because it recirculates air through HEPA (high-efficiency particulate air) filters like those used in hospitals. They say air-change rates are 18 times higher than in buildings, and air does not circulate between rows. Relevant facts give a different view. Regarding ventilation rates, in spite of the HEPA filters, ventilation engineering equations indicate that airborne-pathogen concentrations will be at least four times higher than in typical office environments even though their air changes are higher. This is because aircraft cabin ventilation and recirculation rates per person are lower than in buildings, and buildings use recirculation filters that, while not as efficient as HEPAs, remove more particles because the flows through them are 10 times higher. On top of this, and because their occupancy density (the numbers of persons per unit volume of space) is 40 times higher than in an office building, aircraft-cabin pathogen concentrations reach their peak equilibrium values sooner, with the result that time-weighted exposure ratios are about five times higher than in offices for the same source strength. As another comparison, passenger-aircraft cabin occupancy densities are over three times higher than those of classrooms. Regarding air movement between cabin occupants, the aircraft-cabin ventilation system not only moves air in a circular fashion side-to-side, which is bad enough as this movement can pass some of the air exhaled by one person in a row past others in the same row. It can also pass a portion of each person’s exhaled air six or more rows forward and the same number backwards (if there are that many rows available) due to the turbulence induced at the boundaries of the air supply and the fundamental instability of most indoor air flows, including those in aircraft cabins. Sneezing and occupant movement can also create air movement fore and aft. To add to this, research published in 2007 indicates that low humidity air such as occurs in aircraft cabins, particularly on long flights, increases the potential for influenza infections when a source is present. In September of this year, the U.S. Transportation Research Board combined with the National Academy of Sciences to hold a symposium of key infectious-disease professionals on the subject. Researchers presented findings on the movement of particles and infections between rows fore and aft of the source, demonstrating that there are no systems or measures in place to prevent the spread of infectious disease over several rows. Several researchers observed that window seats were less prone to disease transfer than aisle seats. One study found influenza virus in the exhaled normal breath of some infected persons, indicating that coughing is not the only potential source of infectious aerosols. In conclusion, it would be helpful for everyone if spokespersons were to honestly say that while the risk of getting a respiratory infection from either hand-to-face contact or airborne movement versus other environments is not yet known, and while it may be safer onboard aircraft than in other crowded public transportation environments (that research has not been done yet either), there are some simple-to-implement safety measures recommended for us all. Pre-flight, these are: immunization shots; rest; and the purchase of disinfectant wipes, hand sanitizers and face breathing masks. In flight, these are: if you are ill, wear a mask to protect others (airlines might even offer these to coughers); cough into your sleeve; don’t touch your face with your hands (wearing a mask helps here also); periodically disinfect/sanitize your hands and your surroundings (hard surfaces such as the tray table, arm rests and magazines); don’t face your neighbor when talking; use an open cup of water to raise the humidity in your breathing zone; and point your overhead air vent (if there is one) between you and a neighbor (do not point it at your face) to help prevent any exchange of airborne pathogens and to draw any towards the floor returns where they can be exhausted or filtered out. These measures can be simply and easily described by flight attendants as part of the safety instructions given at the beginning of the flight. I was surprised to learn how many persons involved in infectious diseases and the aircraft industry attendees at the National Academy of Sciences/Transportation Research Board Symposium Washington, DC, Sep 18-19, 2009: Research on the Transmission of Disease in Airports and Aircraft, believed that because air change rate is high in aircraft (some 18 times that in buildings), ventilation is not a problem and in fact is better than in office buildings or classrooms when it comes to dealing with pathogen air pollutants. Air quality measurements and ventilation theory both refute this! The problem with this belief is that air change rate is high in aircraft, not because ventilation rate per person is high which is what governs bioeffluent exposure both in theory and in measurements, but because occupancy density (the number of people per unit volume of space) is high. The fact that human bioeffluent concentrations vary as ventilation rate per person, rather than air change rate, is not just theory. 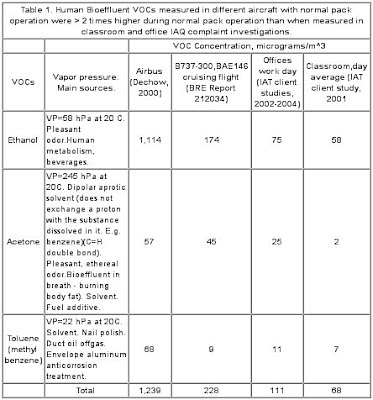 Measurements of bioeffluent VOC concentrations in aircraft are more than double those in office buildings where the fresh air ventilation rate per person is more than double that of airplanes (see Table 1 below). This higher VOC concentration in aircraft occurs in spite of the fact that the fresh air change rate in offices is some 18 times lower than in passenger aircraft. Similarly, the recirculation rate per person in offices is 8 times that in passenger aircraft. With office HVAC systems using MERV 13 filters removing some 80% of 0.3 micron and larger particles, pathogen concentrations where source strengths are similar when measured will be some 4 times higher in aircraft (20 CFM/p free of 0.3 micron particles and larger in aircraft air supplies versus 84 CFM/p free of these particles in office air supplies). 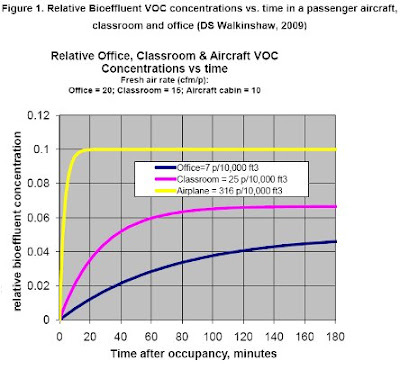 Further, the high occupancy density in aircraft versus buildings and classrooms makes VOC and pathogen exposure dose (area under the concentration vs time curve) for the same source strength even higher (see Figure 1 below). The above measurements and calculations do not include the proximity impact on transmission rate. This factor will increase exposure the closer the seating. Thus the risk of in flight infectious disease transmission between aircraft passengers and crew [e.g. incidences of febrile illness(colds, flu..), TB...], ) is estimated to be at least five times higher than in offices. This is especially noteworthy during current concerns about an influenza-type pandemic (i.e. H1N1). Douglas S. Walkinshaw, Ph.D., P.Eng. ASHRAE Fellow and Member of the ISIAQ Academy of Fellows.